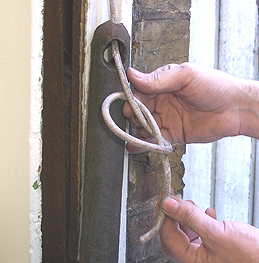 If one of your sash cords is broken the window will not open and shut very well and may want to slide shut when open. 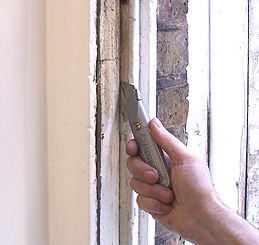 The two cords on either side each go into the sash box over a roller and are connected to a heavy weight which counter balances the window. This is how the window opens with little effort and stays where you want it. If you have a broken cord your window probably won't run smoothly or stay open. This may look like a fairly daunting job as you may feel there is no obvious way to replace the broken cord with a new one, but it is fairly straight forward. You will need to remove the window so you may want to get someone to give you a hand at certain times. The lower window cord is easier to change. 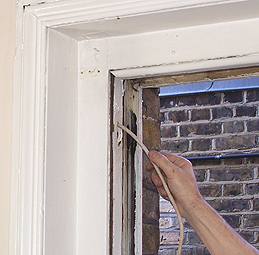 If you are changing the top window cord you will have to remove the lower window first. 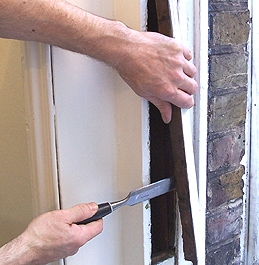 Tip run a sharp Stanley knife down the join which will avoid chipping loads of paint off when you remove it. Using a hammer and chisel carefully prise off the beading. You should now be able to pull the lower window out. Remove they snapped cord end from the window. It will be nailed into the side groove with 2 or 3 large headed nails. If you choose, also remove the cord from the other side so you can put the window to one side for now or, if you don't want to do that, get someone to hold the window with the other cord still in place whilst you carry on. With the staff bead and window removed next remove the central runner(the parting bead). This can be a little tricky. Again this should only be nailed or even just wedged in place but will probably be well stuck with paint. Now you have access to be able remove the loose wooden plate to get to the weights. Carefully prise it open with a chisel or screwdriver. Both weights for top and bottom window on that side are in this box separated by a loose piece of wood. Lift out the weight for the broken cord then remove the old cord end from it. Feed a new length of cord into the sash box from the top over the pulley wheel. (giving yourself plenty spare to play with). This can be tricky as the cord can snag on the box and not come down. Tie the new piece to the weight with a single strong knot. Pull it tight then trim off any surplus cord with a sharp knife. 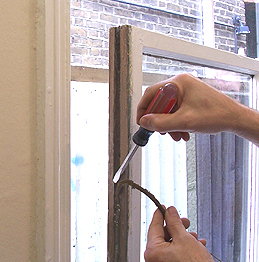 Re-nail the new cord to the window making sure the first nail is no closer than approx. 5-6 inches from the top of the window. (otherwise it may catch on the pulley wheel). Use 3 short nails with large heads. The length of cord is also important. You need to judge the length is not too short or long. 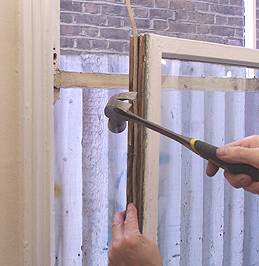 It needs to be of a length so that when the window is closed the weight doesn't bang on the top of the sash box, and when the window is fully open the weight doesn't bang on the bottom. Pull the cord with the weight on a few times to get a feel for where the weight is in the box. NB use only proper sash cord for the job. It comes in different thicknesses for different weight windows. Match the new stuff with the old. Sash cord is made from specially waxed rope. Don't paint it as this will make it go brittle and reduce its life.